It begs the question: why on earth am I not scuba certified? I don’t know if y’all can tell, but I tend to catch onto things pretty late in the game. I’m rarely an early adopter to fads and technology gadgets: I didn’t get into Harry Potter or Friends til the very end of each series (both are now dear favorites of mine), and I still adamantly refuse to join Snapchat (because I JUST CAN’T HANDLE one more form of social media). So yes, I’ve been sitting out of the diving game even after all my travels through tropical climes and reef-happy islands. The more time passed, the more it felt like I had missed out on so many diving opportunities already, so what was the point in getting certified so late in the game, after 10+ years of traveling? How dumb is that thinking? I’m telling ya, I can be insufferably stubborn. But when I suddenly had 12 days in Thailand with nary a plan or obligation, I instantly thought: IT’S TIME TO DIVE!! There wasn’t any thought process beyond that: no debating pros and cons, no contemplating other options for what to do during this trip. My gut was very clearly stating that it was time for me to get scuba certified. I may be stubborn, but my gut instinct always trumps everything else when I’m able to tune into it. Fresh off a fantastic 8 days on Koh Tao in which I blissfully toggled dual roles of Beached Whale and Newly Certified Scuba Diver, I’m here to report that scuba diving is SO MUCH FUN. If you’re like me and have been putting off getting scuba certified for whatever reason, this post is for you. Here’s what it’s like taking an open water diving course on Koh Tao. 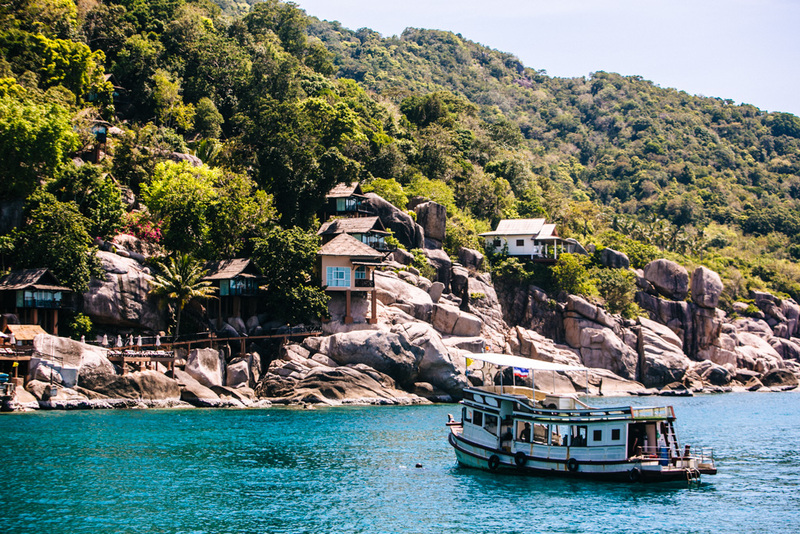 First, you should know that Koh Tao is the cheapest place in the world to get scuba certified. This Thai island is renowned for its diving and its partying: if neither of those interest you, there are hundreds of other islands that might suit you better. 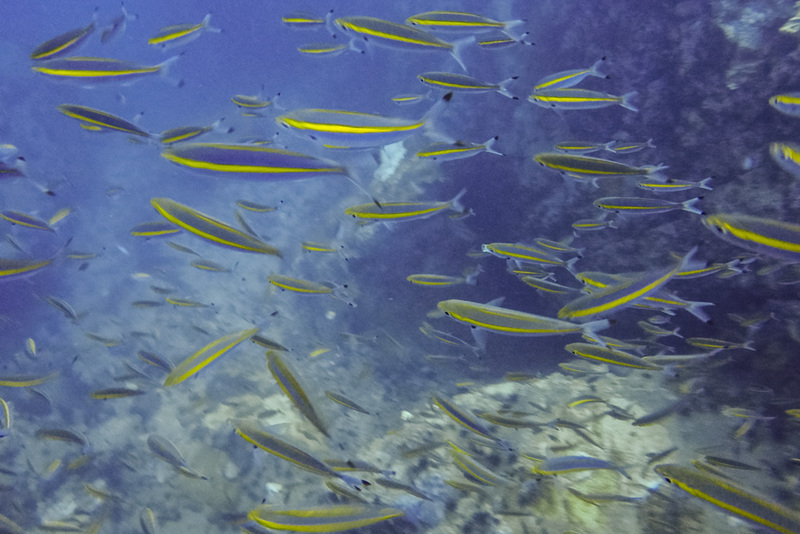 There’s an overwhelming number of dive schools on Koh Tao. How the heck do people pick which one to go with? Most hotels will try to recruit you to sign up with their in-house dive school or, if they don’t have their own, then whatever school they’re in cahoots with. You could also walk down any of the main roads in Koh Tao and randomly pick one that catches your eye. I took a more planned approach and arranged my open water diving course with La Bombona Diving-Cafe based on word of mouth. This was basically the best decision ever because the fabulous crew there took good care of me so that I always felt safe and happy. 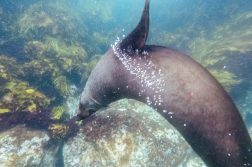 I had an incredible experience diving with La Bombona, as the rest of this post will continually demonstrate. The idea is that you learn the theory and apply it while working up to being able to dive to 18m, which is the deepest you can go with an Open Water certification. Once you have an Advanced certification, you can dive up to 30m. One thing that really appealed to me with La Bombona was how their staff is all from Spain and conduct classes in both English and Spanish. While I was there, there was another group doing their Open Water course in Spanish while mine was done in English. Obviously I wasn’t there to speak Spanish, but I think it’s really cool how they have that flexibility and have incorporated some of the Spanish culture into their onsite cafe (which serves paella, among other Spanish eats). They never mix language groups in any of their classes, and they cap each class at 4 students max. That’s super important – in fact, I’d say that 4 students is the absolute most you’d want in your diving course. Any more than that and training takes too long, and you get less attention from your instructor. I learned how to dive from Sam, who moved to Koh Tao nearly 2 years ago from Menorca. Patient, passionate, and experienced, he was exactly what you’d want in a scuba instructor. My fellow students were 3 guys from the UK, US, and Germany. I loved our group! Wouldn’t you like to learn how to dive here? On our first day of class, we spent the morning tucked in a corner of the dive shop learning theory and the afternoon getting acquainted with our diving gear in the pool. Not just any old pool, mind you – but decidedly the best pool that any dive school on Koh Tao has access to. We got to practice at the Tarna Align Resort, a fancy property in Sairee whose main pool has 3 different depth levels. We started out on the shallow end practicing key skills like breathing and clearing our masks and regulators, then moved to the deeper levels to work on buoyancy and swimming with our gear. Sam would demonstrate a skill first, and then we’d each perform it one at a time until we got it right. With a larger group, it takes longer to get through – but at the same time, I felt more comfortable demonstrating after watching a few other people do it before me. I really think 3-4 students in an Open Water group is the sweet spot. Personally, I found this first day more challenging than the dives we did in the ocean the following days. 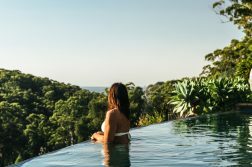 Between trying to process all of the new information we’d been bombarded with and demonstrating mastery of skills we had only just learned, it was a lot to take in – but oh-so-necessary with our first Real Dives fast approaching. Diving at Twins, near Koh Nang Yuan. The final two days of the Open Water course were the most fun, for obvious reasons. 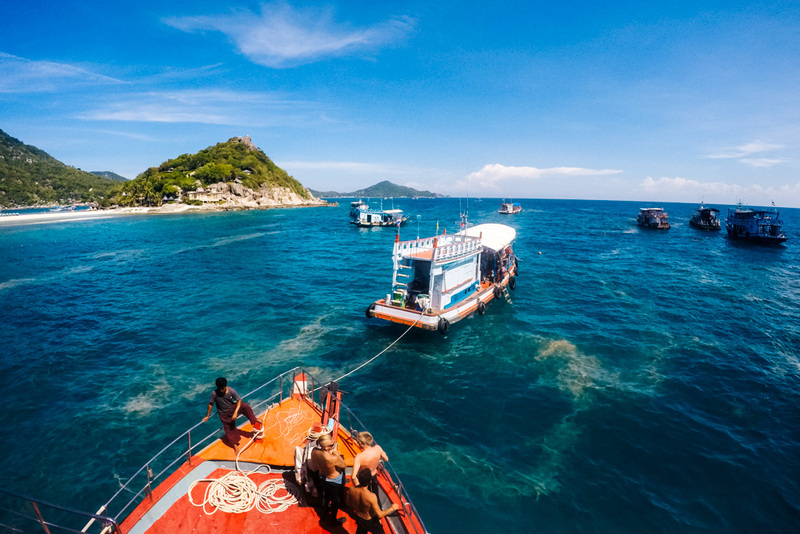 When you’re diving in Koh Tao, you can take either the morning boat or the afternoon boat (or sometimes the night boat) and get 2 dives in before heading back to the island. 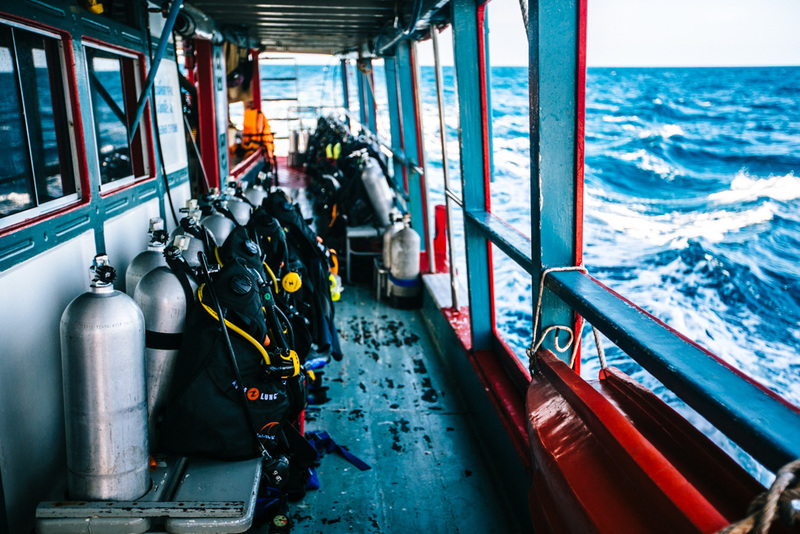 You’ll often find a few different dive schools sharing one boat, and these boats are staggered so that not all of them leave at the same time. There is typically more than one boat at a dive site, though. 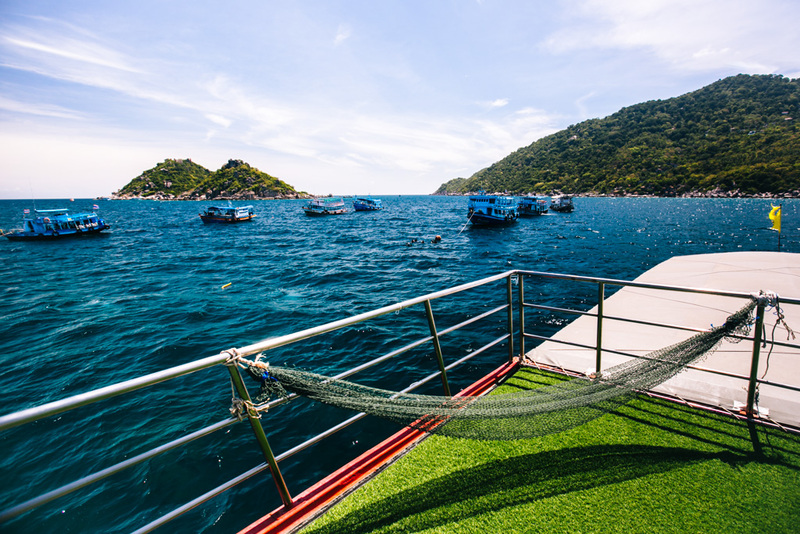 Speaking of boats, La Bombona has an awesome three-decker with the top deck covered in (faux) grass – perfect for laying out on between dives. Despite the fact that I often get seasick (#FORESHADOWING), I absolutely LOVE going out on boats. I am damn near my happiest while basking in the sun at sea, and you better believe I maximized my time up on that deck! If this brings you great joy as well, know that most of the other dive boats don’t have a magnificent top deck like this. Sam flipping into the water; I’m laughing on the left. 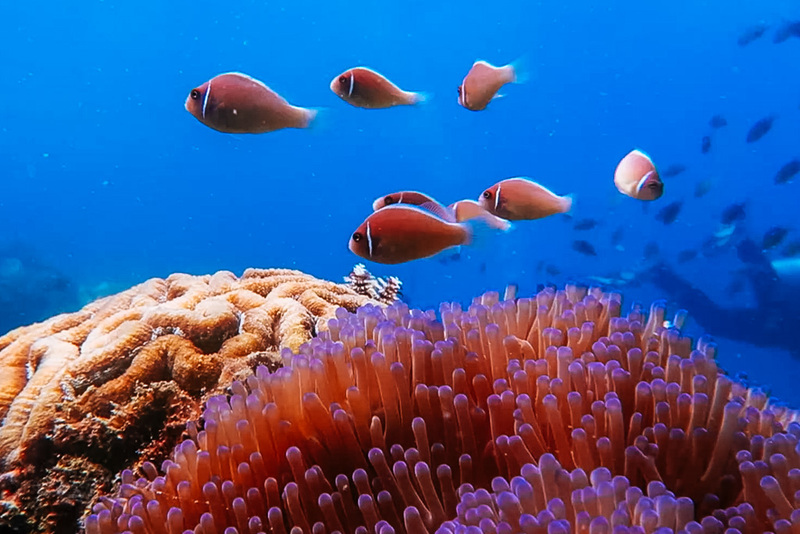 Screen shot from video by William Heintze via La Bombona Diving. So how were the dives?? Well! On the very first one I floated right back up to the surface after we descended. I was completely befuddled, wondering why the f that happened, but I didn’t even have time to panic because Sam immediately swam up and pulled me back down with him. I quickly realized that I should have gone horizontal after descending – staying vertical was no bueno. From then on, it all went smoothly. 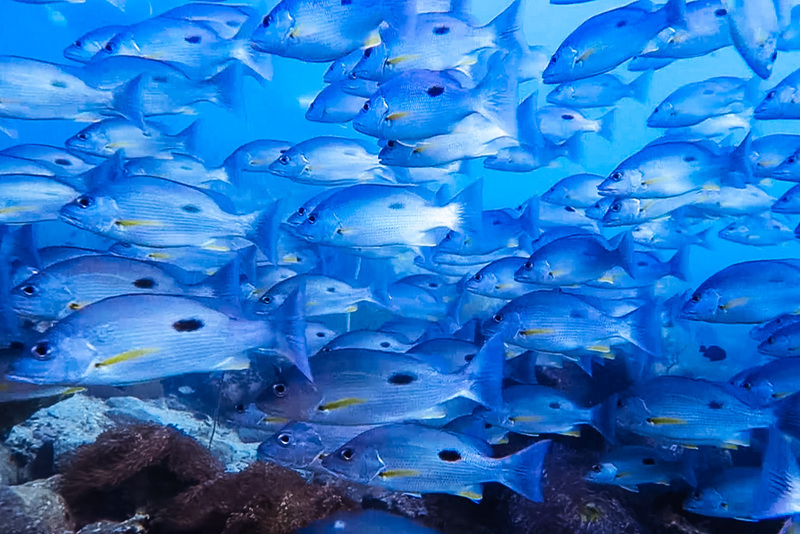 I loved seeing schools full of thousands of fish swimming by. We also spotted some big groupers and moray eels on most of our dives. No turtles or whale sharks, unfortunately (though sometimes they are seen around Koh Tao). Finding Nemo! Screen shot from video by William Heintze via La Bombona Diving. 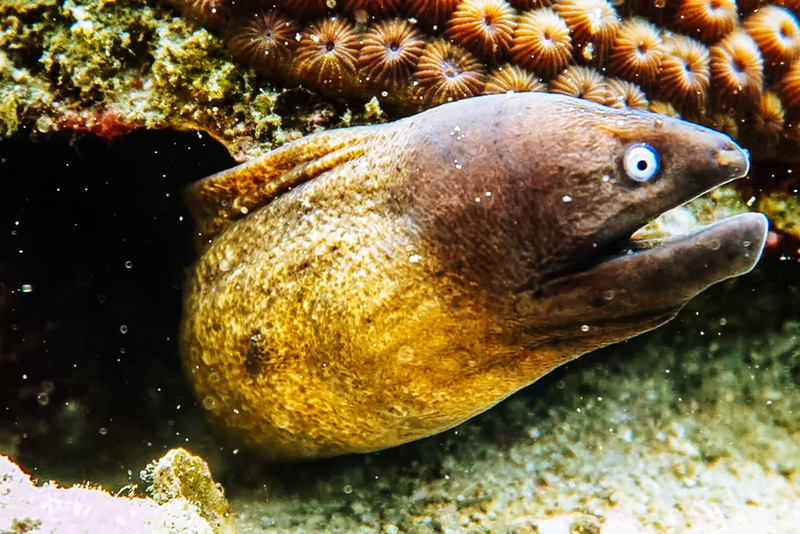 Moray eel. Screen shot from video by William Heintze via La Bombona Diving. Some of the dive sites were just swarming with other divers while we were down there. I guess there’s not much you can do about that, especially when you’re training and can only go so deep – which kind of limits your options for movement. My major takeaway from these early dives? Boy do I need to work on maintaining neutral buoyancy. When you’re neutrally buoyant, you effortlessly float underwater at your desired depth. You can make a few minor adjustments to achieve this, but mostly it comes down to mastering your breathing technique. 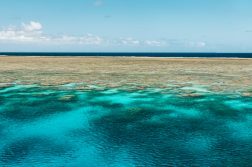 I found it difficult to get close to the reef and fish without fearing that I was going to touch them because I couldn’t hold still. Screen shot from video by William Heintze via La Bombona Diving. One other very note-worthy item: You’re not allowed to take photos during your open water diving course. I totally get why they have this rule – you’ve got so much else to worry about on your first dives that adding camera operation to the mix would just be foolish. But fear not! 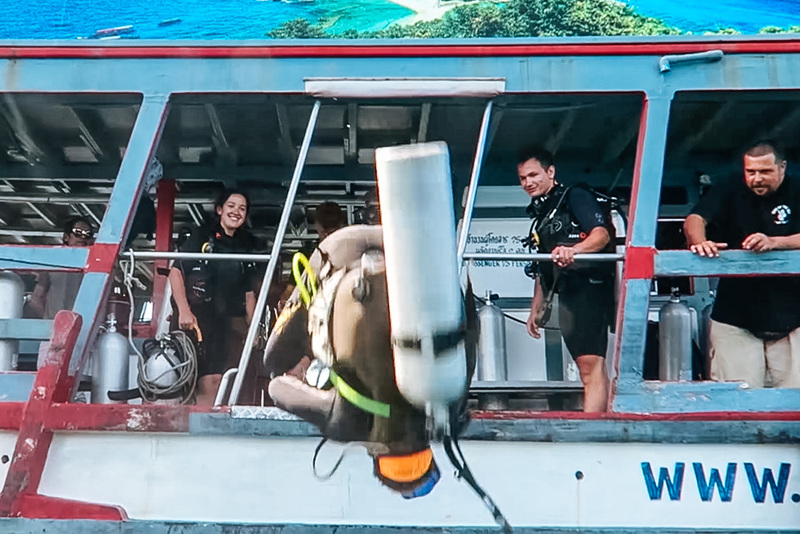 La Bombona has an in-house video team that tags along on one of your dive days to capture both you and everything you’re seeing on your dives, all packaged up into a video montage that you can buy afterwards if you’d like. 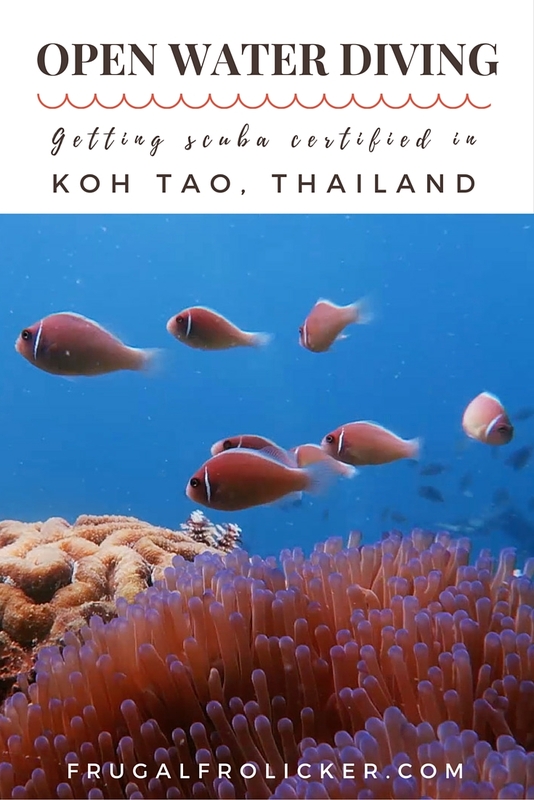 This isn’t something a lot of Koh Tao dive schools offer their students, so the fact that it was an option for us at all was pretty awesome. I’d have liked to have had some still shots of the fish or of us in action (hey, I’m a photographer not a videographer! ), but I grabbed some screenshots from the video that will do just fine. Video by William Heintze via La Bombona Diving. Note that I had to cut out the super-cool Outro at the end because the video file was a tad too large! With all 4 open water dives completed and our final test passed with flying colors (which by the way is SO SO EASY, don’t even spend a second worrying about it), we headed back to the dive school for celebratory drinks and t-shirts. Photo via La Bombona Diving. After my open water course, I wanted to do a few “fun dives” where I could just enjoy diving without having any tests looming. So I hopped on a morning boat out to Chumphon one day with divemaster Guido and one of the students from the Spanish Open Water course. Oh my lord, the water was insanely choppy that day. I remember sitting on the top deck watching the boat lurch back and forth, up and down, thinking “wait a second, how am I not feeling nauseous right now?!”. 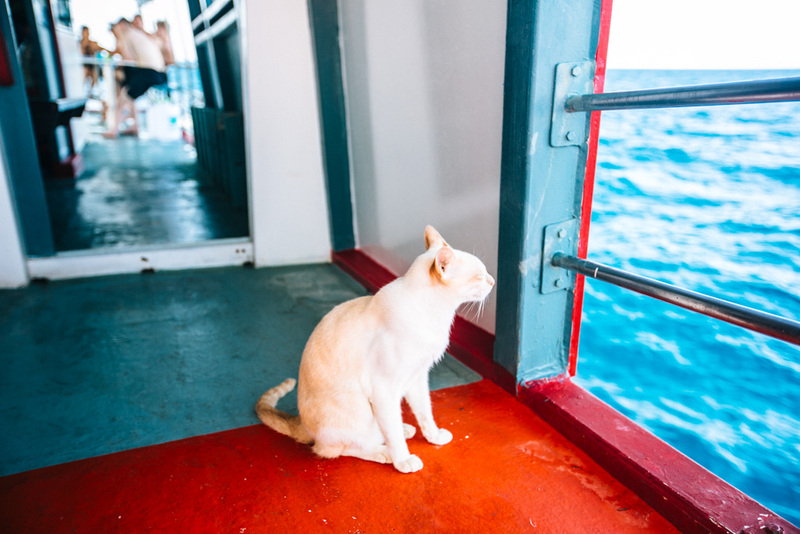 I had a brief moment where I got to experience the rough sea as a normal, non-motion sickness prone person would – and then I went from 0 to 60 and vomited just before we were to get our gear on. Guido gave me some peppermint balm to rub under my nose and assured me I’d feel better underwater. He was right – I felt almost normal again once my surroundings stilled. Gracias a Dios! The best thing about these fun dives was being able to escape the traffic and have my own space to explore. While I did my training dives, there was a lot of brushing up against fellow students and near-collisions as we all tried to grasp bouyancy while being hyperfocused on following Sam (and maybe didn’t notice the diver directly above or below us). But on the fun dives it was just the 3 of us with more space and probably a higher comfort level in the water. In my opinion, the Chumphon dive site is better suited for Advanced divers than Open Water divers because it goes so deep. We Open Water divers can only go down to 18m, so there was a lot of it we missed out on. Still, we managed to see plenty across two dives here. I attempted to document it with my GoPro and the results were pretty shoddy. Underwater photography is trickier than I imagined! In case you couldn’t tell: I am so happy I finally learned how to dive! I can’t wait to try diving elsewhere around the world. I have a feeling it’s going to be a handy tool in my travel toolkit. I hope to complete my Advanced certification in the near future – if you have any suggestions for where I should go to do it, leave a note in the comments below! And finally, I can’t recommend La Bombona highly enough. 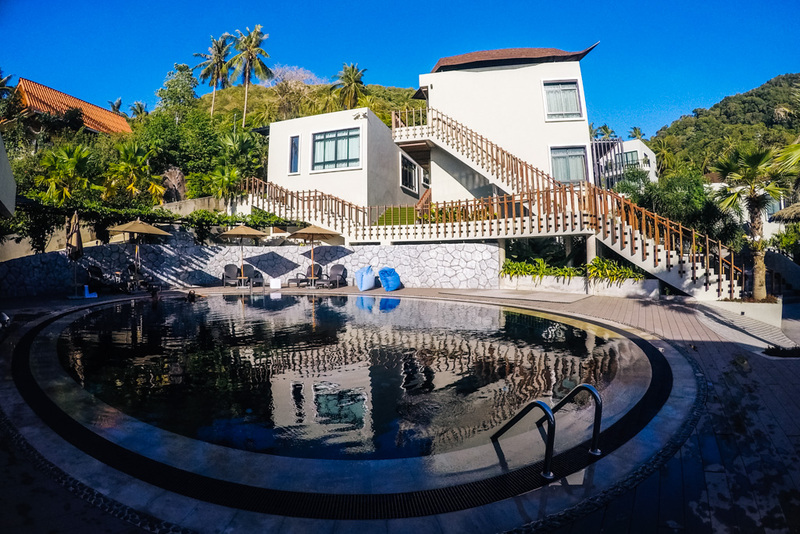 They manage to differentiate themselves from the pack of dive schools in Koh Tao with a lower price point, amazing practice pool, spacious dive boat with a sundeck, in-house videographer, and bilingual Spanish staff. 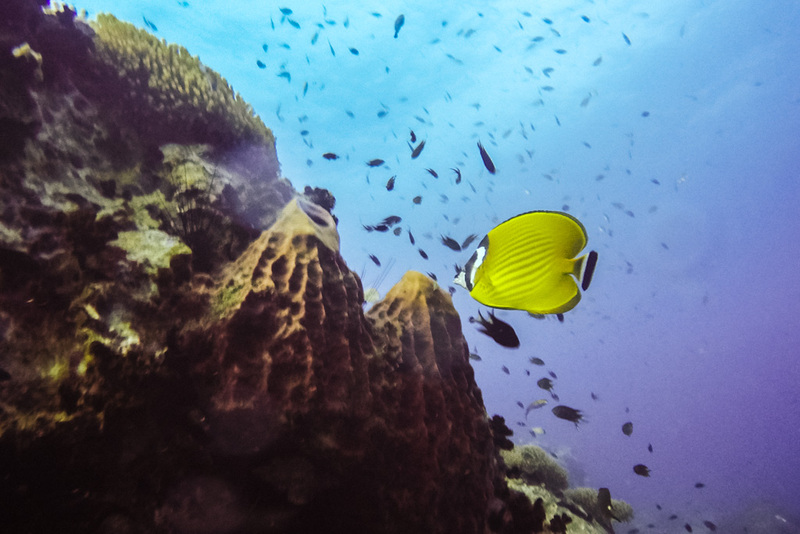 If you’re heading to Koh Tao to learn how to dive, definitely look them up. Thank you to La Bombona for hooking me up with an Open Water diving course, certification, and fun dives. Note that all opinions expressed here and elsewhere on this blog are my unbiased own, and are uninfluenced by any gifts or incentives I may receive. 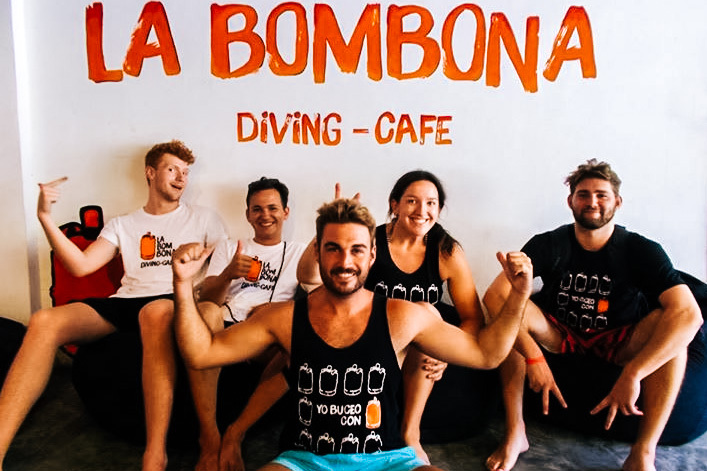 La Bombona Diving-Cafe is located in Mae Haad, within a 5 minute walk from the main pier. An Open Water diving course with them costs 7500 THB (about US$213). Advanced, Rescue, and Divemaster courses are also available. Contact Rocio for more information and tell her I sent you! Two fun dives cost 1600 THB (US$45), or 1500 THB (US$43) for former La Bombona students.